In his latest article in the e-zine The Agurban, rural development guru Jack Schultz from the Boomtown Institute listed the 10 things every small town should have. Read what he has to say, and then ask yourself how your own town is doing. What would it take to make these things a reality in your community? Community Foundation - A Community Foundation allows a community, whether it be a single town, county or even a region, to marshal small donations and funds into the efficiency of a large foundation, altering the fabric of that community for the long term. Indiana has been the leader in setting these up in every one of their counties, because of the leadership of the Lilly Foundation. Brain Bank - Many of our small towns have seen a tremendous brain drain of their best and brightest. However, that drain could be converted into a tremendous asset and several towns have started to cultivate those ex-residents into ambassadors for their communities. North Dakota is doing it in a state-wide initiative. Entrepreneurial Education - The new paradigm in economic development is to cultivate your own entrepreneurs. Just as the best high school sports teams start to develop their talent in grade school, those towns that want to be part of the new economy are developing entrepreneurial educational initiatives into their high schools and grade schools. Generation E Institute in Battle Creek, Michigan, is the best that I've seen. Young Professional Organizations - Gen X and Gen Y needs to be nurtured. They are the leaders of the future and those leadership skills need to be developed now. The best I've seen are YPIowa in Iowa and YBNext in my hometown of Effingham, IL. Arts - Quality of life issues are going to be more important in the decision of where to live and develop a career. Baby boomers went to where the jobs were. Gen X & Y young people are more focused upon quality of life for that decision. All arts are becoming more important for them in that decision. Make it easy for them to choose your town by emphasizing your art assets. Paducah, Kentucky, has done it best. Tourism - Find the inexpensive ways to promote visits to your town. Use videos on your cable system, motel keys with info and very inexpensive ezines to let people know why they should come, visit and stay. Downtowns - They are going through resurgence with the upstairs being fixed up into apartments and condos. 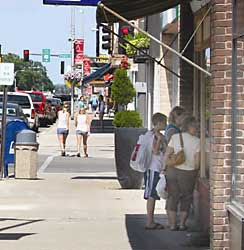 Having people living in the downtown area encourages more restaurants, bars, coffee shops, etc. That in turn encourages more to live downtown and the cycle continues upward. Oxford, Mississippi, is the best I've seen. Mentoring - Two models stick out for me. One that I saw in Carroll, Iowa, has developed a mentoring program for their college students, pairing them up with local jobs and CEOs during the summer. The other is aimed toward at-risk grade schoolers, putting local volunteers in one-on-one mentoring. We're up to 130 mentors in Effingham. Downtown Signs - You can't have enough signs that show visitors how to get to your downtown. If they can't find it, how are they going to shop there? Jackson, Michigan, has the best I've seen. From every direction signs route visitors to the downtown area. Angel Investor Network - Local banks can help to provide most of the start-up funds for new businesses, but having an angel investor network provide the equity to help get the new entrepreneurs into operation.